Enjoy a breezy weekend away in the city, with our top picks for urban holidays in May. Italy is never a bad idea, especially in May. With its low rainfall and warm temperatures, Bologna is our top pick for a late spring city break. Home to one of the world’s oldest universities, where the likes of Copernicus and the doomed Archbishop of Canterbury Thomas Beckett studied, the city has a buzzing nightlife and plenty of culture. Sip espresso in the Piazza Maggiore square and hide from the midday sun under the famous porticoes, which will keep you shaded for some 23 miles of wandering. If you’re feeling active, climb the 498 steps to the top of the Le Due Torre. The two mighty towers were built to show the wealth of the Asinelli family, and offer an incredible view of the city. Afterwards, test Bologna’s culinary reputation as La Grassa (the fat one) by tucking into local favourites. Trattoria Danio on Via San Felice sells some of the city’s most highly rated ragu – or as we know it, Bolognese sauce. Centro Storico, Bologna’s historic centre, is the best place to base yourself if you’ve only got a few days in the city. Characterised by its narrow streets, porticos and piazzas, it truly is the heart of the action. Stay in a classic Italian style at Albergo Panorama, with its spacious, traditionally decorated rooms. Bolognina, just behind the train station, is a multicultural neighbourhood fast becoming a hipster hotspot. With its ultra-modern rooms, the Savhotel is the ideal base for exploring the area. 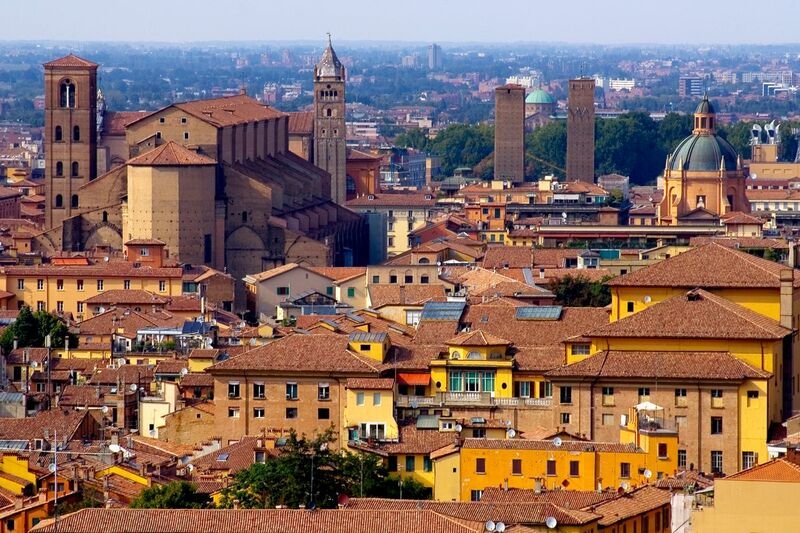 Best time to book flights to Bologna: 6 weeks before departure, saving 15% on average flight prices from the UK to Bologna. Visit Casablanca in May and you can enjoy some of the longest days of sunshine that the city receives all year. Made famous forever by the eponymous 1942 film, Casablanca is only three hours away from the UK and great value for money. Stroll through warren-like alleys of the Old Medina, appreciating the unique blend of Arabic, Roman, and French culture. Sip freshly squeezed orange juice as you drift around the city centre, taking in the splendour of the dominating, creatively designed Hassan II Mosque and the tree-lined boulevards of the Parc de la Ligue Arabe. The art galleries are also excellent, with the Villa des Arts a particular hit for its Art Deco facade and collections from prominent Moroccan artists, such as Abou Elouakar Mohammad. Hotels near the Old Medina will put you in the perfect base for exploring. The Ibis Casablanca City Centre is a great value option at £47* per night, and a great location near the Casa Port station. Ain Diab, or the Corniche, is Casablanca’s waterfront neighbourhood and one of the coolest places in the city. When you’re not relaxing on the beach you can party in the bars or learn to surf. Casablanca Le Lido Thalasso & Relax hotel is a luxurious option, with prices starting at £62* a night in May. 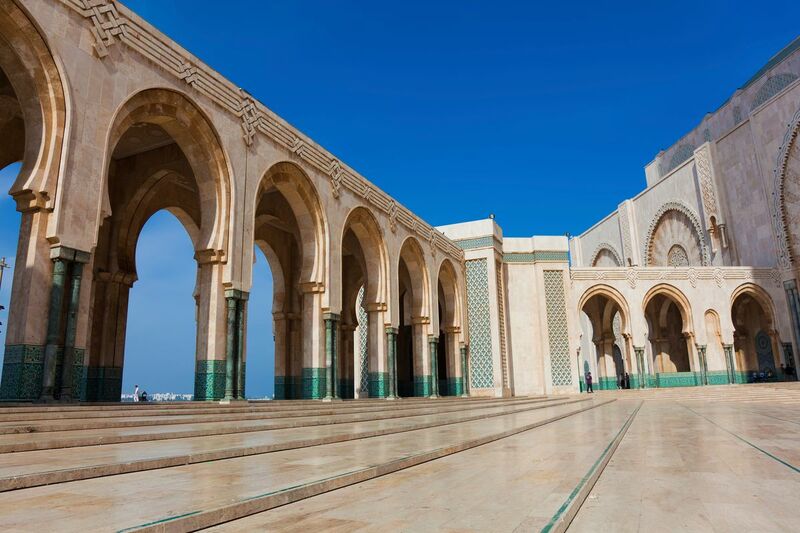 Best time to book flights to Casablanca: 8 weeks before departure, saving 8% on average flight prices from the UK to Casablanca. 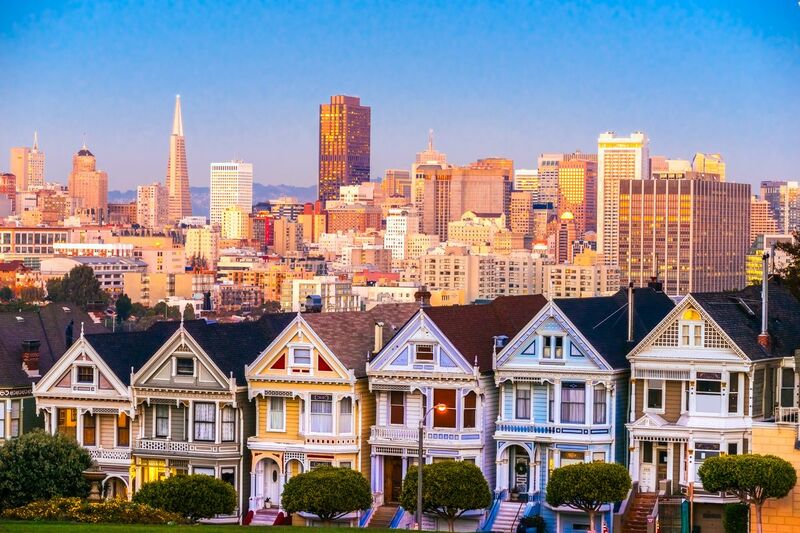 Known for its diverse food scene, iconic bridge and sea-lions sunbathing on the piers – yes, really – San Francisco is one of those places that has a feel-good vibe. May is the ideal time to visit, as the tail-end of the spring turns to summer and the Carnaval comes to town. Start out in the Mission District, where you’ll find outstanding joe at Four Barrel Coffee, burritos bigger than your face at local favourite La Taqueria and some of the brightest, most colourful murals in the city. No trip to the misty city is complete without a boat tour to the famous Alcatraz prison, but it does get choppy so pack some travel pills. If climbing the city’s hills gets tiring, take a break in Mission Dolores Park – where the hippy movement began back in the 1960s. Union Square is the heart of San Francisco and you’ll find big shops, restaurants, bars and theatres. The Hotel G is just a short walk from the square itself, with stylish rooms boasting historic features – the building dates back to 1909. For a more casual stay, look for hotels in North Beach. This area is walking distance from Fisherman’s Wharf and Chinatown. The San Remo Hotel, which has been open since 1906, is a great option in this neighbourhood. Best time to book flights to San Francisco: 7 weeks before departure, saving 12% on average flight prices from the UK to San Francisco. If you’re dreaming about soft sands, rushing waves and a cool drink on a sunlounger, these are the best beach breaks during May. May is one of the driest months in Cape Verde, making it ideal for setting up your beach lounger. It takes about six hours to reach these volcanic islands off the coast of West Africa, and on arrival you’ll find plenty of dreamy beaches. This is especially true on Sal, where the sands are far emptier than in summer. If beaches aren’t your thing, head inland to the lunar-like landscapes and scramble around to your heart’s content. The sea temperature is hot in May, too – a toasty 23°C – so it’s the perfect time to try windsurfing or classic board surfing. Or simply pull up a lounger at Morabeza Beach Club Restaurant and watch the waves come rolling in. The main town of Santa Maria on Sal is a good bet for beach hotels, with some excellent value options like Aquamarina Suites – check out the Indian restaurant underneath! For family stays, Vila Do Farol Resort is a short drive from the centre, but sits on its own private shore, with kids’ clubs and poolside/beach bars to keep everyone entertained. 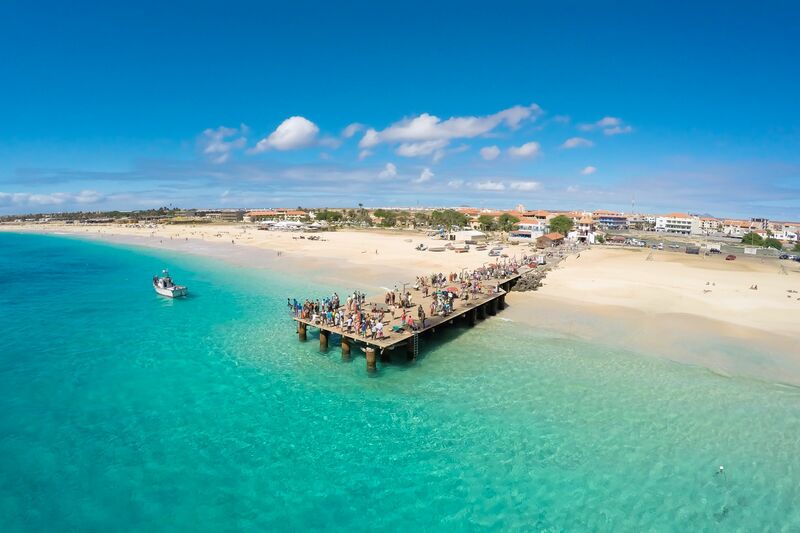 Best time to book flights to Sal: 0 weeks before departure saving 37% on average flight prices from the UK to Cape Verde. With an average of 14 hours of sunshine glinting off its smooth white stones every day, the coastal city of Dubrovnik effortlessly combines centuries of culture with a brilliant beach holiday. May is the perfect time to visit before the summer crowds arrive, and Croatia’s rocky shoreline means that the water along the south is perfectly clear, making snorkelling and lounging around on bobbing boats a highlight of any trip here. Bored of the shores? The red-roofed city is also a great choice for Game of Thrones fans, who’ll recognise the fortress walls, churches and castle as the mighty King’s Landing. You’ll get more insight into these places on a walking tour lead by enthusiastic locals. Old Town Dubrovnik is the heart of the tourist action. The historic buildings are home to traditional shops, bars and restaurants where you can tuck into local goodies like grilled fish. With its spacious sun terrace overlooking the city’s red roofs, Roko House is an excellent value option. For sea views, head east outside of the city walls to Ploče. This is where you’ll find the city’s main beach, Banje, and flashy places to stay like Hotel Excelsior. 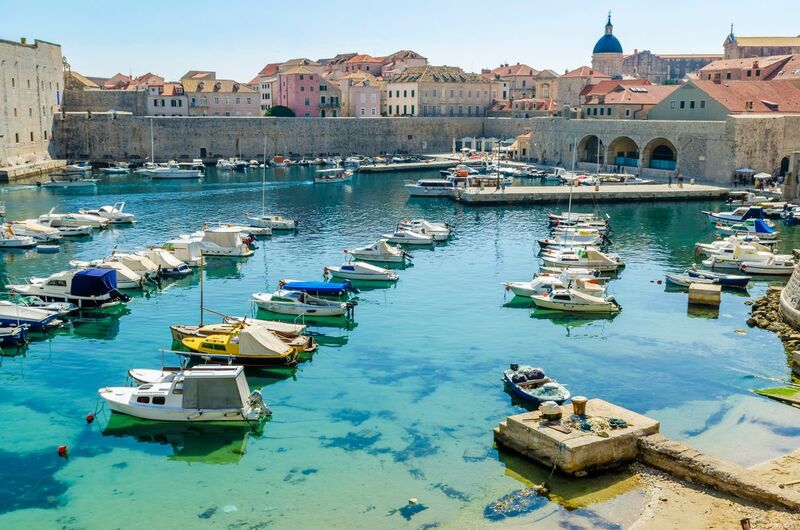 Best time to book flights to Dubrovnik: 9 and 23 weeks before departure, saving 9% on average flight prices from the UK to Dubrovnik. 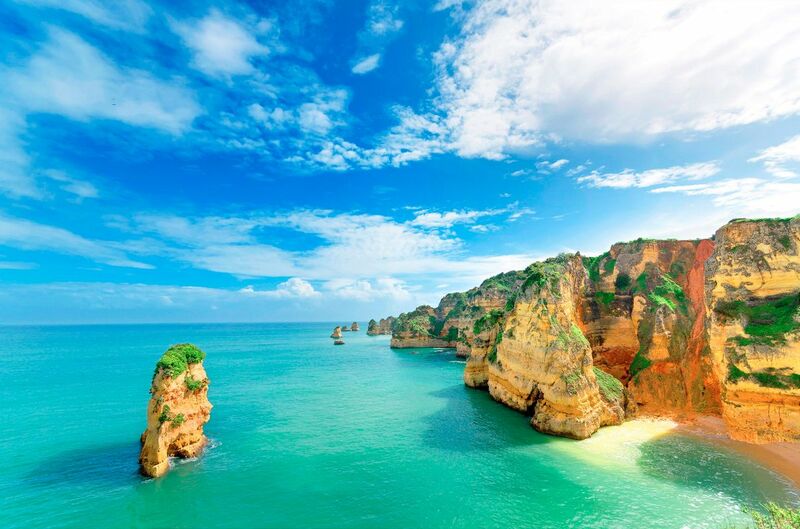 With plenty of sunny days in May, Portugal’s Algarve region keeps those tans topped up and is a hit with young families for its consistently clean beaches and shimmering shallows, ideal for rock-pooling. Take a boat trip into the Ria Formosa Natural Park and visit Faro’s secluded island beaches or head along the coast to bustling Albufeira, where party animals spill out of the bars onto the sandy Fisherman’s Beach. Once you’ve had your fill of sand and surf, check out one of Europe’s biggest water parks, Slide and Splash, or head inland for a stroll around the medieval town of Silves – complete with a Moorish castle! If you don’t want to stray far from the airport, base yourself in Faro – the capital of the region. The Hotel Faro & Beach Club offers the best of both worlds, as it has a city centre base as well as a club on the beach. For even more fun in the sun, look for hotels in Albufeira near Praia d’Oura and the strip – a line of neon-clad cocktail bars, family-friendly restaurants and souvenir shops. Club Ouratlantico is a fab option if you have kids in tow, with two huge outdoor swimming pools. As it’s an aparthotel it’s easy to whip up quick meals for fussy little ones, and it’s a short stroll from the beach too. Best time to book flights to Faro: 5 weeks before departure, saving 16% on average flight prices from the UK to Faro. Where would you go in Palu? 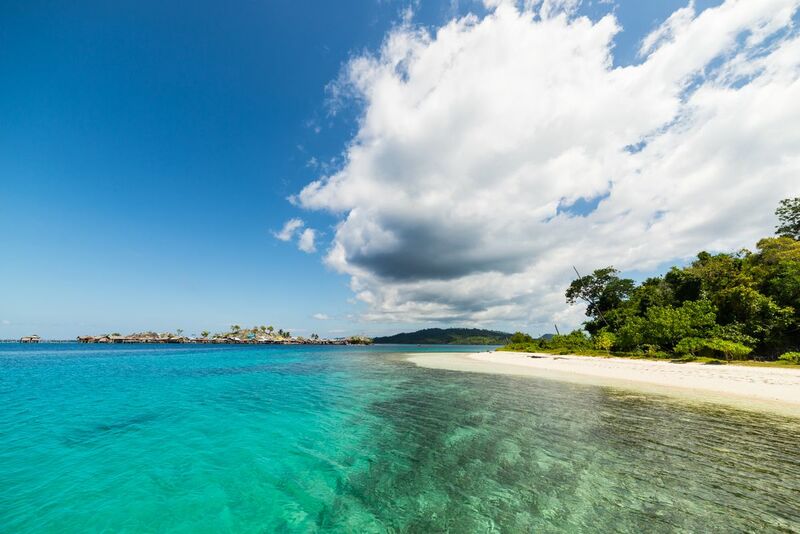 If you’re looking for a tropical paradise then you need to make your way to this secret location on the island of Sulawesi in Indonesia. The beach is called Tanjung Karang and is located on the tip of Palu Bay, only an hour’s drive from Palu city. Why is it worth making the effort to visit? This place will make you teary it’s so stunning. The combination of the bright colours, turquoise water and white sand will make you never want to leave. It is the perfect place to grab a Bintang, relax and enjoy a weekend of quietness away from the mass-tourism in Bali. What makes Palu such a great place to go in May? May is the best time to come discover this idyllic paradise because it will be the off-season so over-crowding is something you will never have to worry about. Because there won’t be many people around, it’s also a great time to visit some of the best diving spots in the world. This place is only 70km away from the equator, making it the perfect temperature for swimming all year round. What are the best things to see and do in Palu in May? Diving is definitely the number one attraction which brings people here but if you are a lover of the beach, a good book and relaxing under a palm tree then this is the place for you. If you’re not so eager to jump into the water to explore the sea life then you can enjoy it from one of the local’s glass-bottom boats. Don’t forget to find the guy in the local village who makes carved heads with glasses and earrings out of coconuts! Any recommendations for bars, restaurants or cafes? At the resort there are loungers available for you to chill out on. If you like something more local then walk down the beach about 200 metres and pop into one of the local restaurants which have huts on the edge of the beach for you to enjoy. Less is more here so be prepared to eat local and enjoy the simplicity of the island. Want to get your party shoes on?These are the best events and festivals around the world, all happening in May. Miami is a city full of surprises. You’ll arrive expecting brashness and glitz, and leave feeling culturally satisfied. The nearby SunFest Art and Music Festival is a sun-drenched cultural extravaganza, just along the coast in West Palm Beach. Stretching across four days, SunFest has three stages with more than 50 bands across a diverse range of genres – this year’s line-up includes Keith Urban, Onerepublic and Papa Roach. Stick around after the festivities are over and head back to Miami to see the famous Art Deco buildings along Miami Beach. Afterwards, recharge your batteries with a slice of world famous Key Lime Pie at Joe’s Stone Crabs. West Palm Beach is a city in its own right, 70km from Miami. If you’re mainly here for the festival, stay somewhere like the central boutique Hotel Biba (rooms from £77). Alternatively, the festival is doable as a day trip if you’d prefer to stay in Miami – try Chesterfield Hotel & Suites and you’ll be right in the heart of party (and Art Deco) central, South Beach. Best time to book flights to Miami: 23 weeks before departure, saving 4% on average flight prices from the UK to Miami. From tasty stroopwafels (soft, chewy disks of caramel and pastry) to tender, smoky bacon, the Dutch know what they’re doing when it comes to food. This obsession comes to life during May when around 100 food trucks – and 50 thousand hungry visitors – descend upon the old gasworks in Westerpark for the annual Rollende Keukens (Rolling Kitchens) festival. Expect more than just food, though – from acoustic sets to soul singers, dancing to pizza-making demonstrations, this is an unmissable way to experience the ‘Dam. It’s easy to work off those extra calories admiring the canvases in the Rijksmuseum, chugging around the canals by barge, or enjoying colourful local culture in the red light district. Choose your level of comfort with the Westcord Art Hotels, just north of Westerpark. These two neighbouring design hotels offer 3-star (from £138 a night) and 4-star (from £162 a night) rooms. Both are 10 minutes away from the city centre by bus, and an easy stroll from the food festival. This magnificent city lights up in May, as crowds turn out to celebrate the fall of Constantinople in 1453. With comfortable, T-shirt wearing temperatures of 21°C, you can catch all the parades that culminate on May 29th at the Golden Horn – an historic piece of land that juts out into the Med. 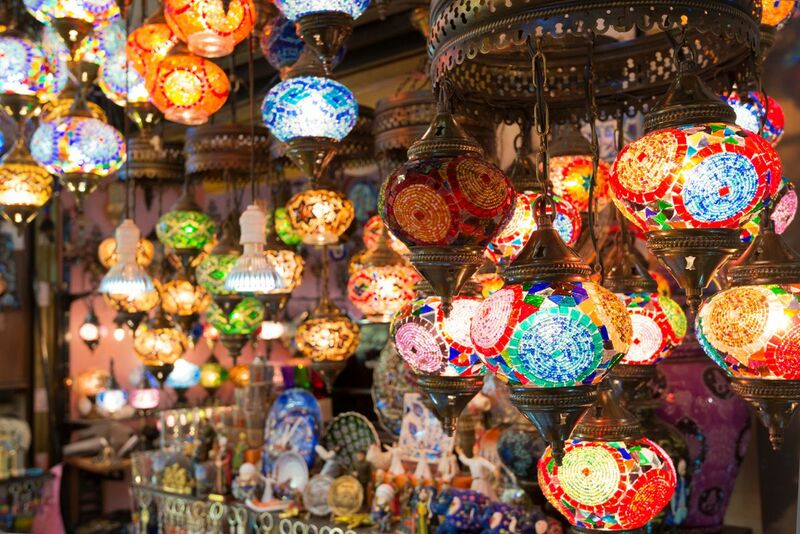 Spend the rest of your time haggling for saffron in the spice bazaar, learning bit about Islam in the 500 year-old Blue Mosque, and crossing the Bosphorus by ferry. This is the most epic half hour journey you’ll ever take, as it bridges the gap between Europe and Asia. Base yourself in the historic hub of the city, Sultanahmet, and you’ll be just streets away from the Hagia Sophia, Topkapı Palace and many more incredible sights. Live like royalty from £47 a night at the boutique Sultan Palace Hotel or save money on meals with a kitchenette-fitted apartment at Sultanahmet Suites. If you’re feeling lavish, you can still add extra hotel features like breakfast and a private balcony. Best time to book flights to Istanbul: 5 to 8 weeks before departure, saving 7% on average flight prices from the UK to Istanbul. Weather data provided by Weather2Travel. *Published April 2019. All prices are lowest estimated prices at the time of publication and are subject to change and/or availability. *Skyscanner looked at 250 million exits on flights over a three-year period to make the Best Time to Book data as robust and accurate as possible. Our overall results should be considered as a guide for travellers. While Skyscanner has identified the average flight prices and best time to book, there will never be one date where it is guaranteed that flight prices will be at their cheapest. However, there are clear trends we can see that are useful to show travellers. Skyscanner is the world’s travel search engine, helping your money go further on flights, hotels and car hire.